This last day we started easily as Christine had to pack and bring her luggage to my room. It’s go-slow day, but we launched ourselves finally on the Quest to L’Ouest for napkins. 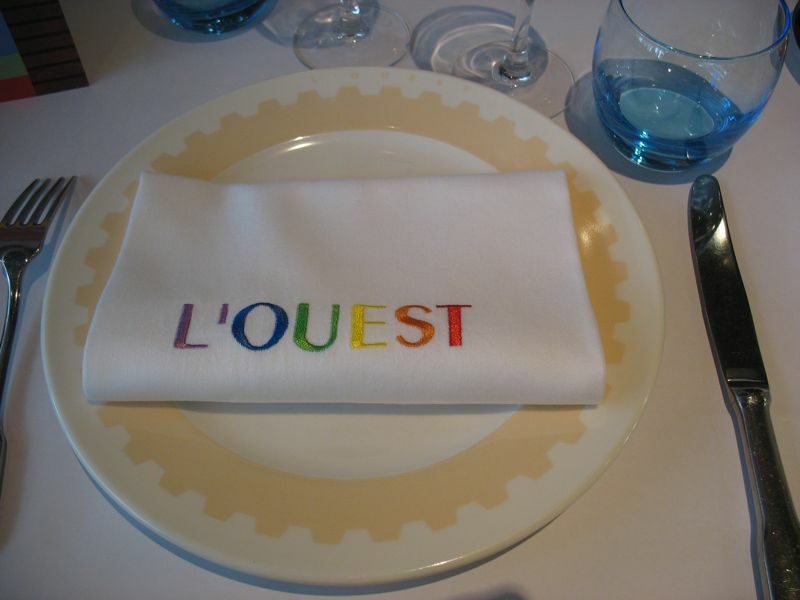 L’Ouest–the West–had a small boutique that sold all of the four brasserie’s napkin styles, and we were collecting. We’d started with Le Nord, walked to Le Sud, but still had two more to go. So Christine and I took the red Metro line to the end and found our way to the river, which would lead us to the restaurant. She stopped into a market to buy 2 clementines, and the young man heard us talking English. “You like Bush?” he asked. I shook my head and he grinned. “Obama,” I said, and he grinned again, giving us a thumb’s up sign. Everyone likes to talk about our elections. After a brisk twenty minute walk (When did I ever start walking so slowly? Compared to Christine, I’m a tortoise, I think) we arrive. 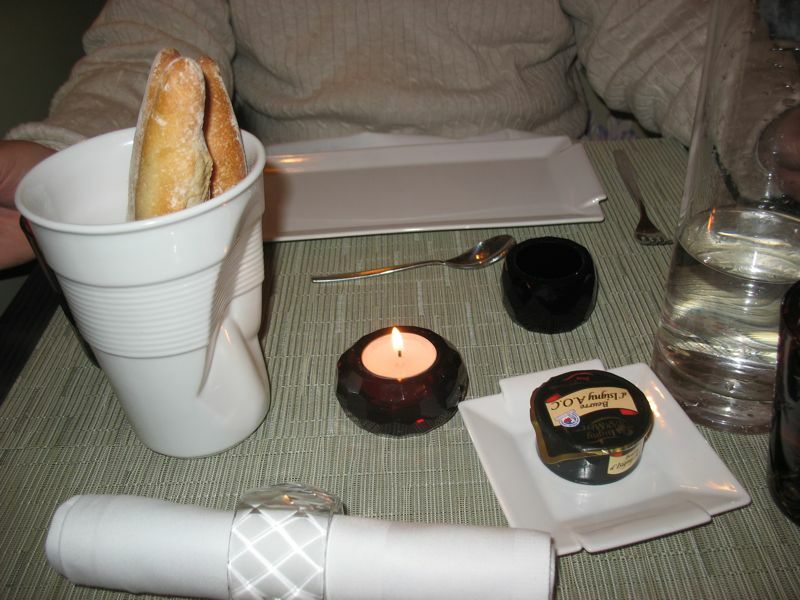 Unlike the small charming brasseries in the town center, L’Ouest caters to the business lunchers, the busy suburbs. We sat across from the kitchen–perfect ringside seat to the action. 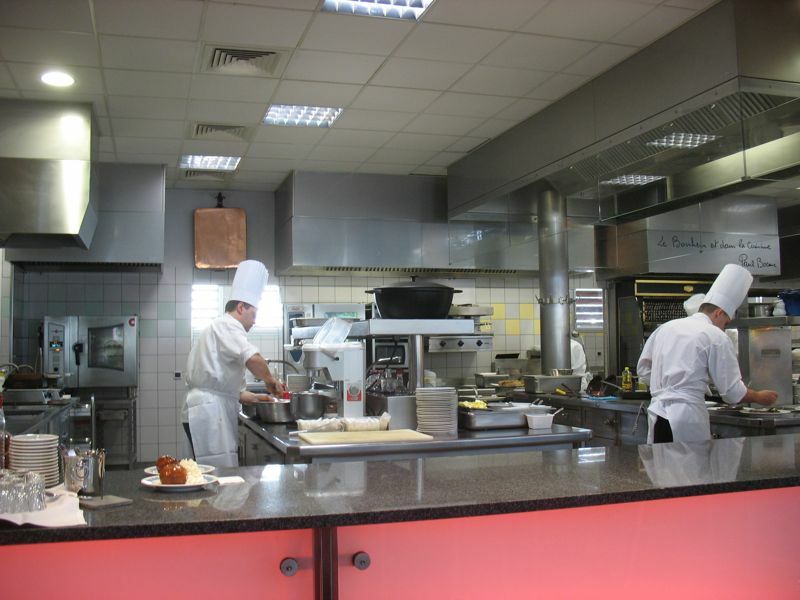 We were directly across from the dessert prep area, which when we arrived was nearly idle. By the time we finished our lunches, this area was hopping, and we had fun watching the chantilly (whipped cream) being piped from a gleaming silver machine, dressing up the presentations. 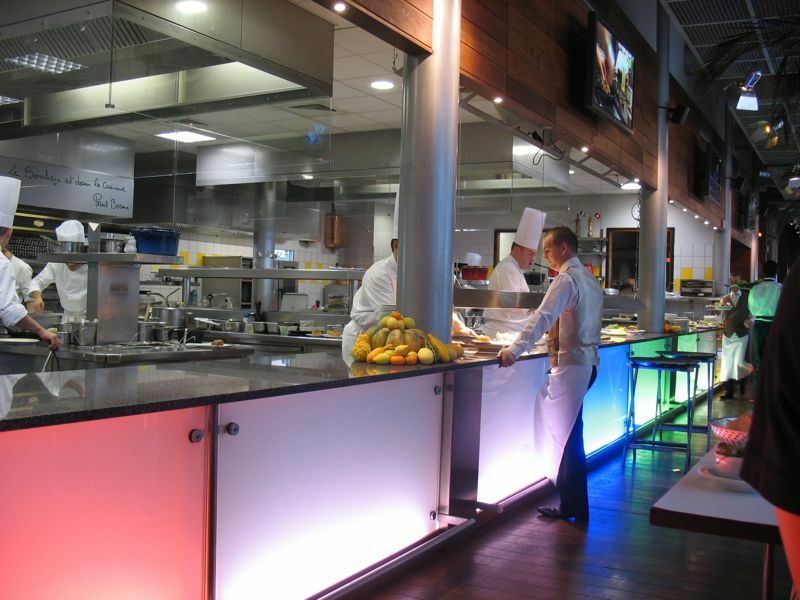 This restaurant had a palate of soft jewel tones, and the glowing lights in the front of the kitchen echoed these colors. 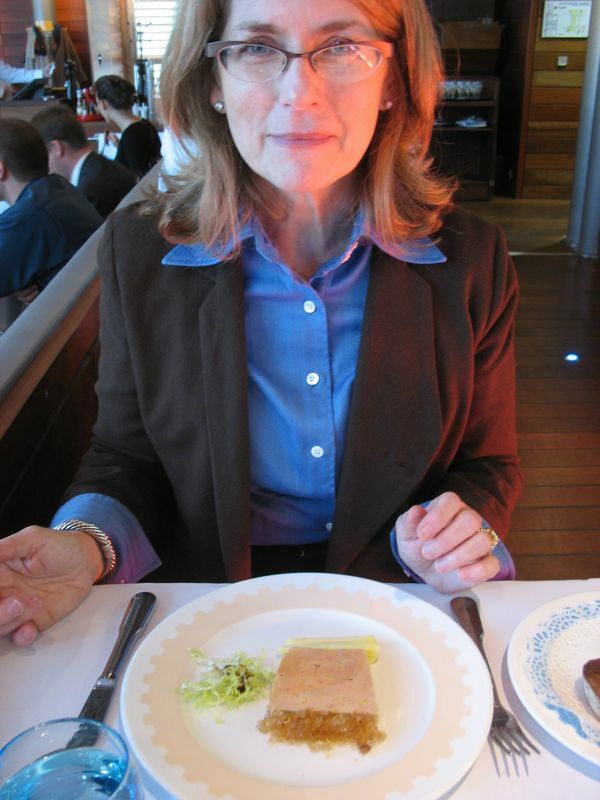 Christine’s lunch of foie gras–perfection. My salad was a work of art. Underneath the mushrooms and cheese was a coil of split haricot verts, cooked & chilled. 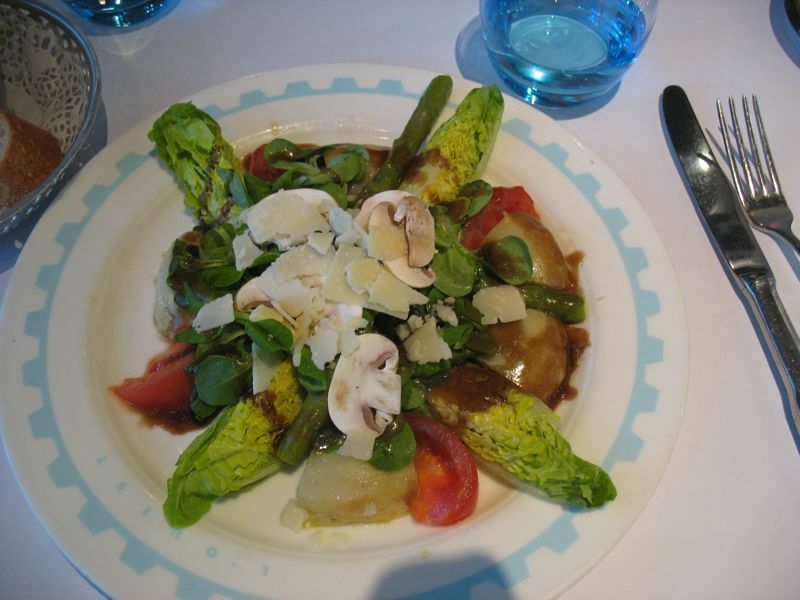 Artichoke hearts, quarters of romaine, asparagus and tomato rounded out the feast. 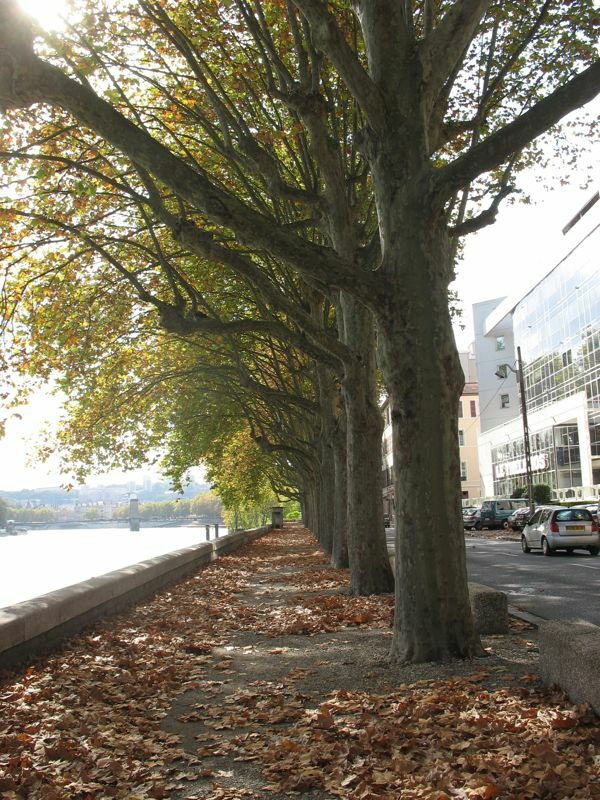 Walking along the Saone river, after leaving the restaurant. We relaxed at the hotel room for a while (she checked in for her flight) and then we were off to the train station, via the Metro. She had her carry-on, with straps like a pack, over her shoulders and carried her straw bag. I managed her suitcase. One transfer, two more stops and we were there at Part Dieu. The tracks were a crush–Friday afternoon rush hour. Christine figured out where our car would be, and we snaked our way to the approximate place. The train stopped and a wild crush of people crowd the door. She got on, I lifted her suitcase up, kissed and hugged her good-bye and stepped off the train. Within 3 minutes, the train slowly pulled out. They don’t mess around with late schedules, here. I waved good-bye and walked over to the Mall, intending to tackle Carrefours (their version of Wal-Mart) but was too tired to face it. I bought the folders I needed at the local stationers, and headed down the escalator to the Metro, hearing English–but with an accent. It turned out to be two young men down from Ireland for the weekend to help a friend celebrate his birthday. They followed me along through the transfers to Place Bellecour, where we said good-bye. It was a bit wild, for I’m fine if I’m bumping around trying to find places, but when I have to show others, it’s a bit nerve-wracking that I’ll mess up. I did fine, though, in the Metro’s Friday night rush hour. 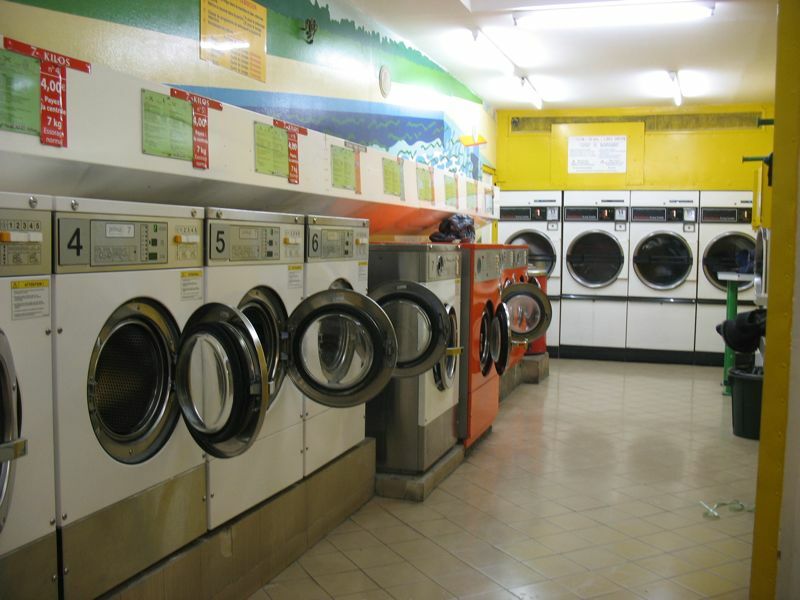 I gathered up the clothes and headed to the laundromat–just a few steps away from our hotel (another reason I like it so well). They’ve upgraded dramatically: their control machine (for soap and the washers/dryers) now accepts paper bills. Yay! Thirty-five euro later (three loads, wash and dry) we have clean clothes. (Good thing, because at home is still my broken washer.) Dave finds me at the laundromat, carries some laundry home. We think about Christine on her way to Paris, then home, and miss her already. We walk the neighborhood, looking for a place to eat, and decide to try the restaurant at Institut Paul Bocuse (it’s a theme, yes) where they have a hotel/restaurant management school. 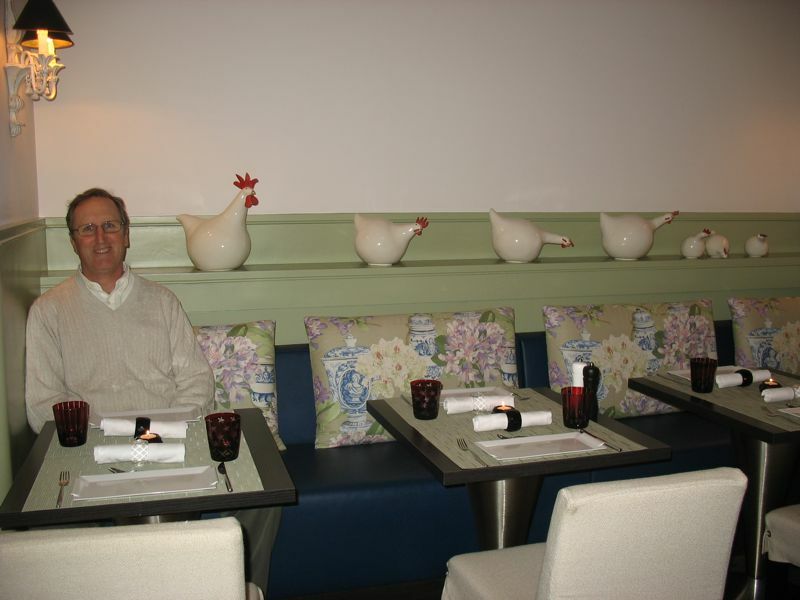 I thought of our daughter Barbara, and her love of chickens when I saw the display behind Dave’s chair. 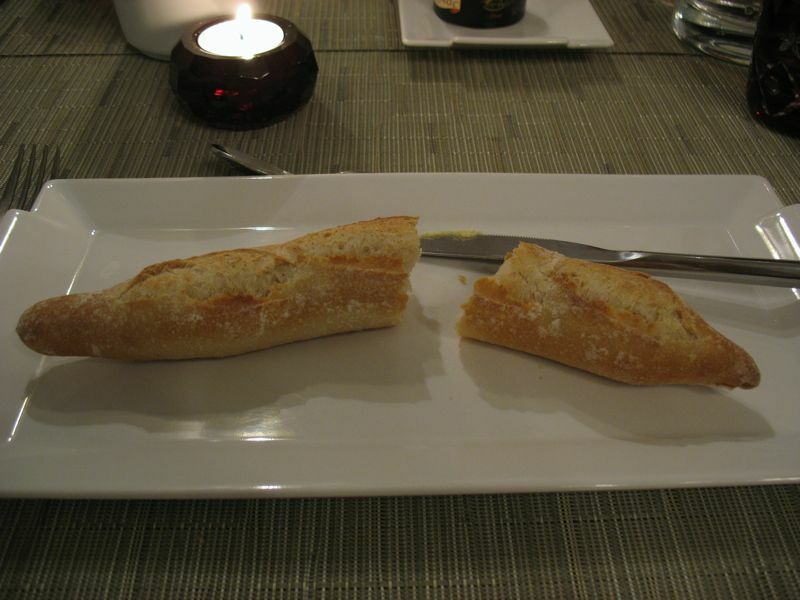 The warm breadsticks were brought in this crushed plastic cup–only it was ceramic!–which instantly made it Very Cool. This was “millefeuille de legumes grilles et marines au pistou” and remember that Blogger doesn’t do accent marks, of which there were many in that phrase. 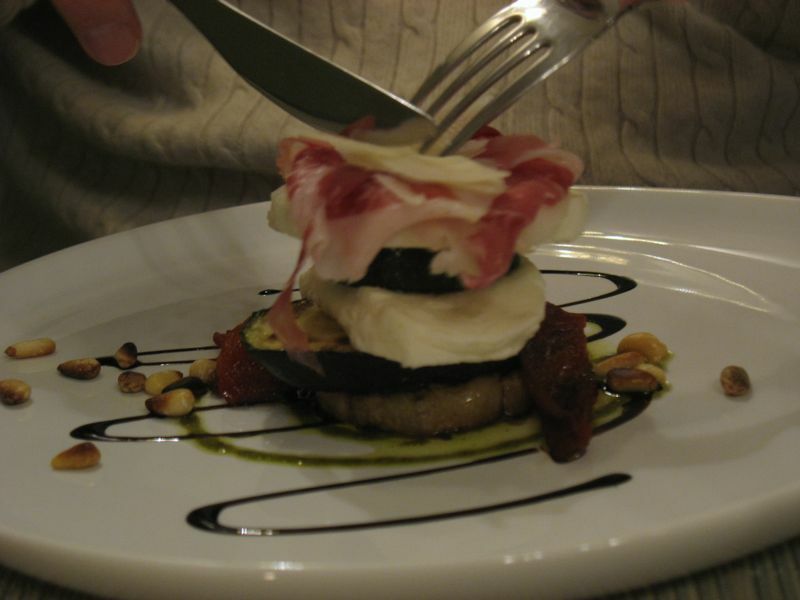 It was a multi-layered stack of grilled vegetables, with a garlic pistou, or sauce. It was topped with a prosciutto-type ham, and it was delicious. 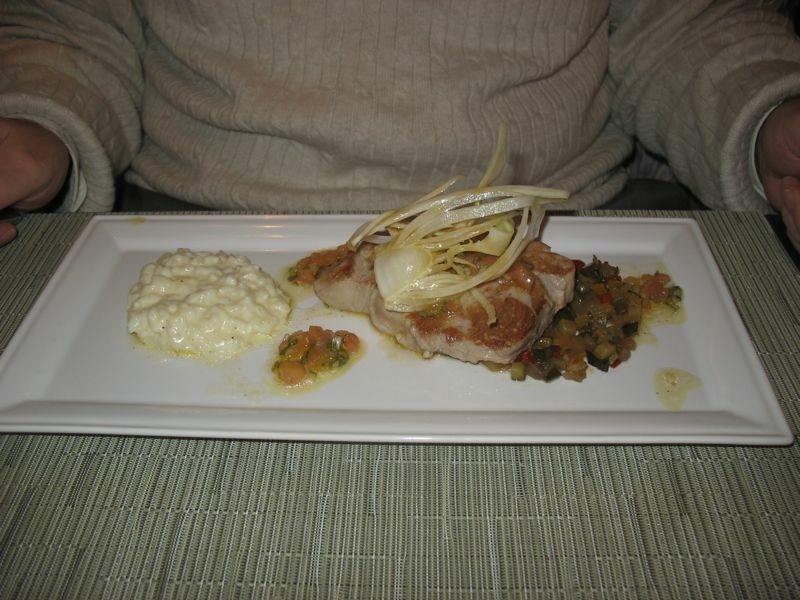 We each had “thon rouge a la plancha et ratatouille” in other words, grilled pink tuna atop ratatouille. 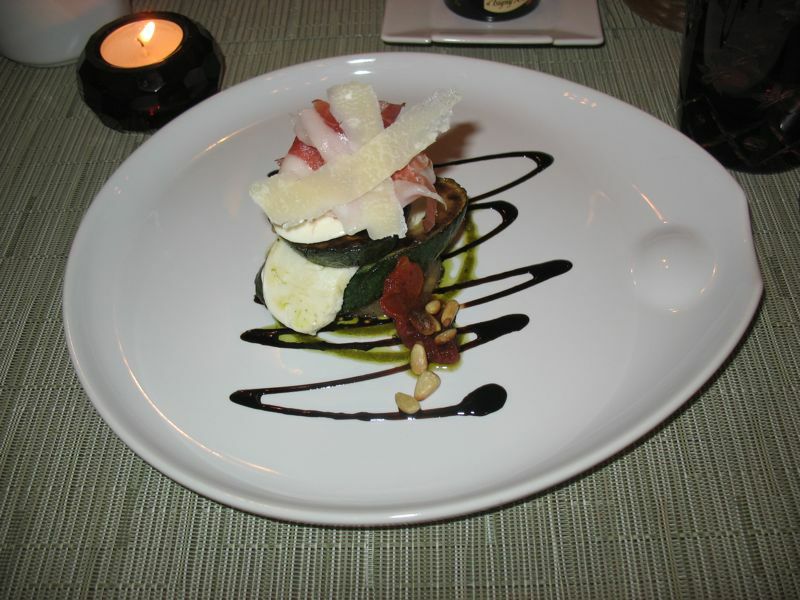 On the side was risotto, and the wild looking garnish was an anise-tasting vegetable (can’t think of it’s name). 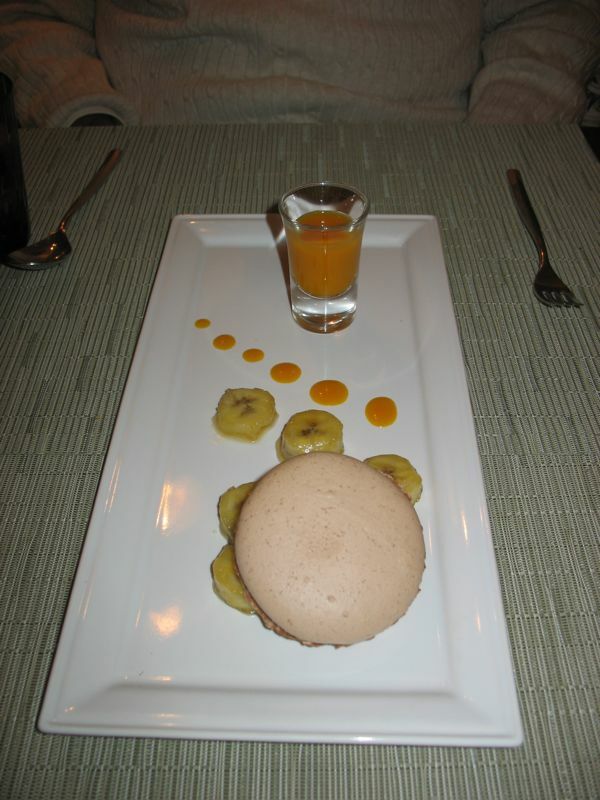 Okay, this one’s “macaron chocolat, coulis fruits de la passion” and it’s delicious with a great presentation. 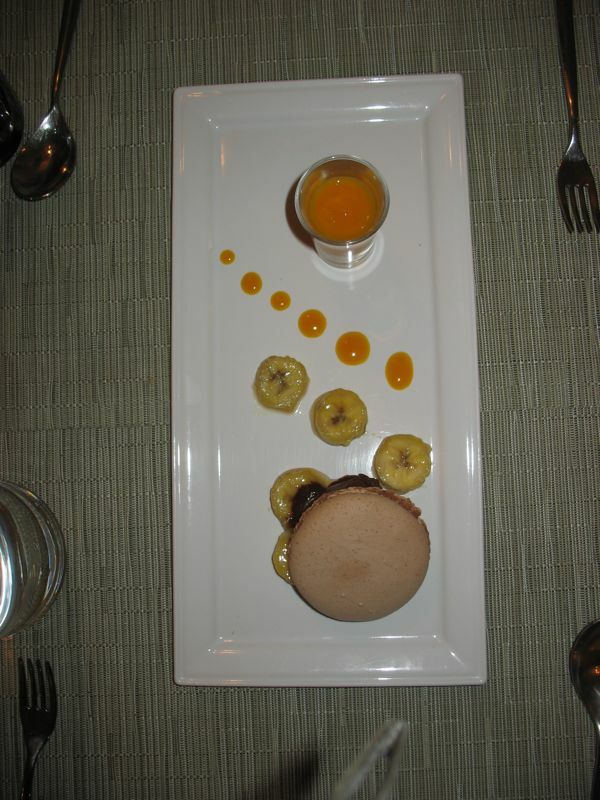 It’s a giant macaroon, with passion fruit sauce and some bananas for garnish. We walk home. The weather’s turned colder today, and the street’s quieter. We have both had to sleep with earplugs to keep out the street noise (we keep our windows ajar), but maybe not tonight. 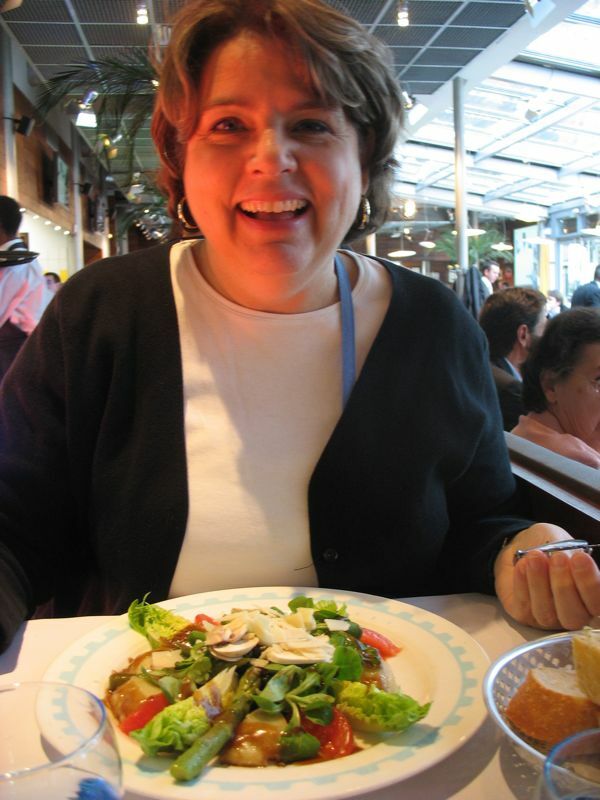 We call Christine in Paris to make sure she’s safe and sound–she is. And so the week’s coming to an end. Last day for Christine and one more day for me. Dave’s staying until his “conference” is over, coming home next Wednesday. Was the “anise-tasting vegetable” a slice from a fennel bulb?